Flanagan’s Daylight light piece 4 ’69 (1969) is included in Tempus Fugit at Cayon Gallery, Madrid until the 1st of February. Image courtesy Cayon Gallery. 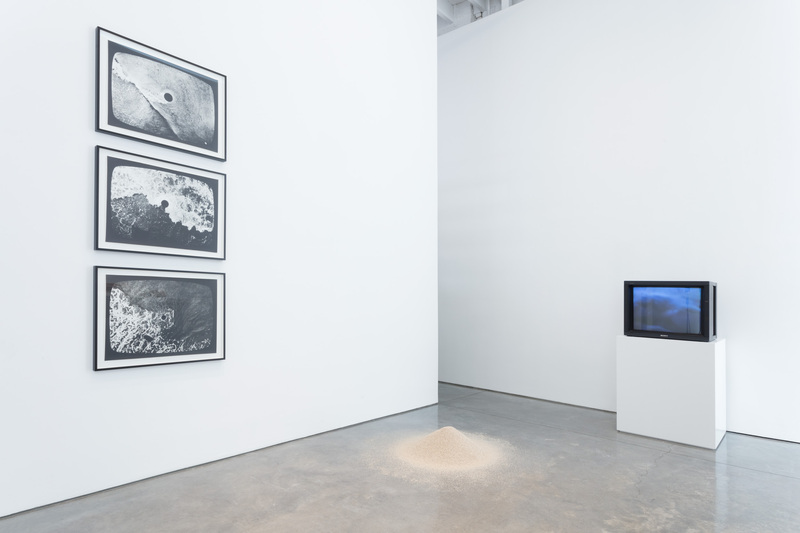 The exhibition aims show the paradox of the representation of the passage of time within a static medium and takes its title from the Virgil verse “but flies, meanwhile flies irreparably the time.” The exhibition also includes Jan Dibbets, Spencer Finch, Nancy Holt, Bernar Venet. More info here. Barry_Flanagan_The Hare is Metaphor_Video on Vimeo. By now you’ll know what to do! 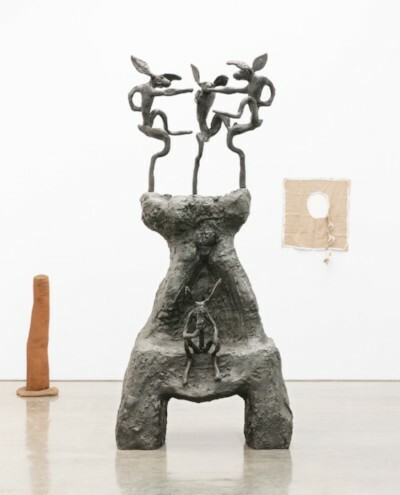 The exhibition, on view until June 9th, brings together a selection of Flanagan’s iconic bronze hares from the 1980s – 1990s and his lesser-known works made with rope, sand, cloth, stone, ceramics and light as a sculptural component (largely from the 1960s – 70s). These show alongside a series of small paper collages, drawings, prints and films, a hole in the sea (1969), sand girl (1970) and bollards project (1970). 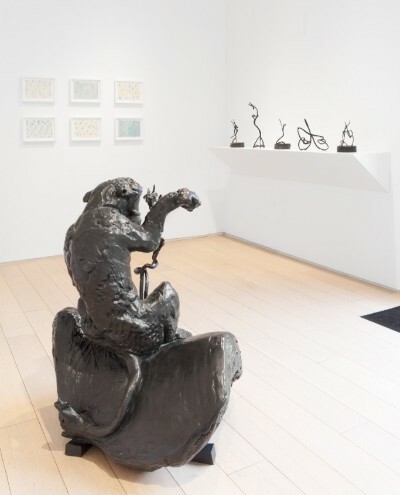 In 1979 Flanagan’s investigations turned to figuration, modelling and casting in bronze at a time when the medium was as unexpected as the soft sculpture and use of building materials had been to its audiences fifteen years previously. He was drawn to the figure of the hare, the motif for which he is now best known, via his immersion in country pursuits of game keeping and poaching. Flanagan’s primary fascination, however, lay in the hare’s anthropomorphic potential; its ability to magnify a range of expressive attributes, to convey meaning and feeling beyond what he felt was possible in the manifestation of human form. For more information on the exhibition, please contact info@paulkasmingallery.com and check out our website and our twitter & instagram pages for updates. 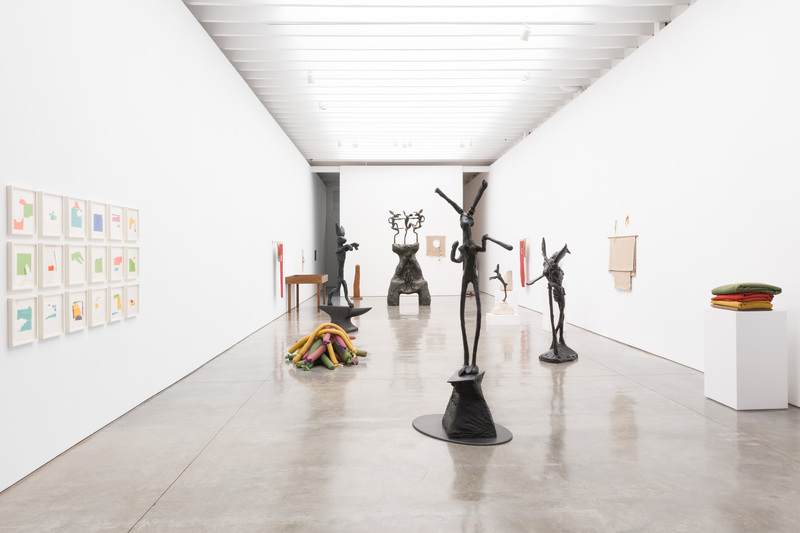 Images: Installation views of Barry Flanagan The Hare is Metaphor, Paul Kasmin Gallery 2018, © Barry Flanagan photos by Diego Flores, Courtesy Kasmin Gallery. 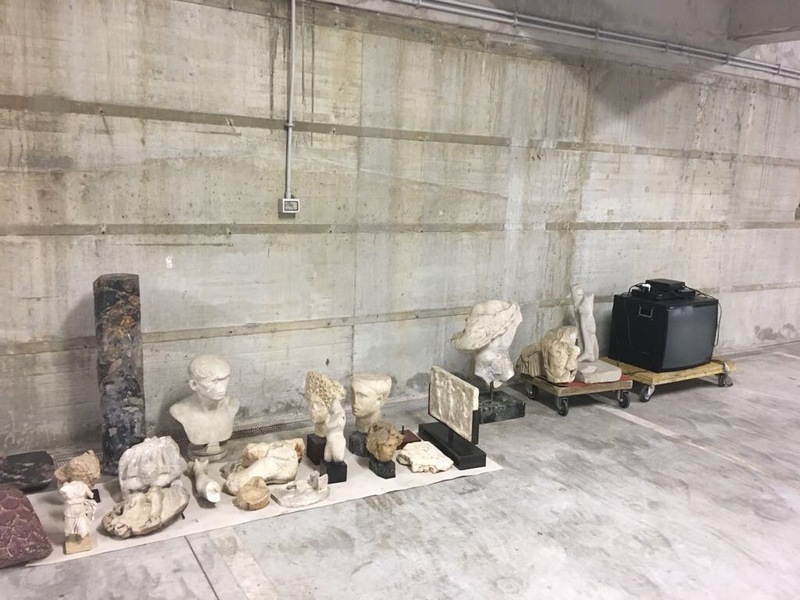 Currently in Rome, the Director of the Estate of Barry Flanagan, Dr Jo Melvin and Vittoria Bonifati, present Sculptureless Sculpture at Villa Lontana. 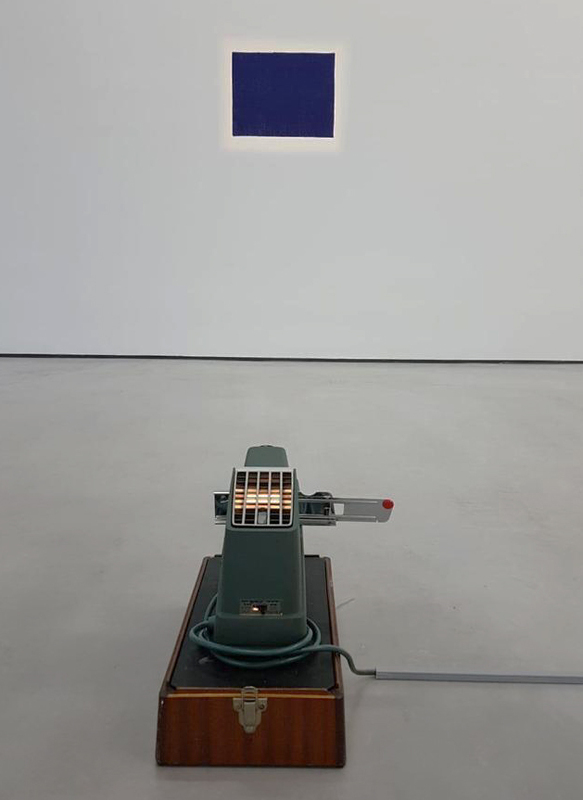 The exhibition draws selected artworks and fragments from the Fondazione Santarelli collection and Flanagan’s contemporaries, John Baldessari, Mario Merz, Ad Reinhardt along with Ketty La Rocca and Elisabetta Benassi (the latter pictured). Installation view with Ketty La Rocca Appendice Per Una Supplica, 1972 (background). 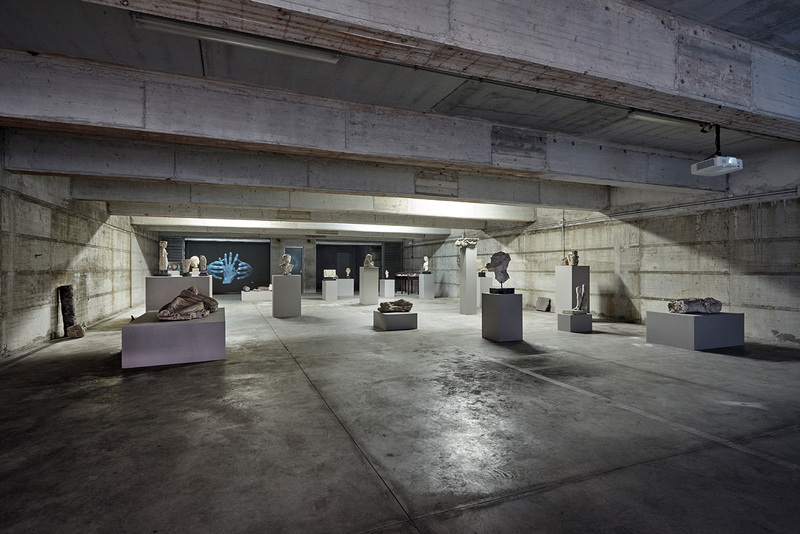 The exhibition runs until the 6th of June, more information on the exhibition and forthcoming residency program can be found in a great feature in Art Tribune online. 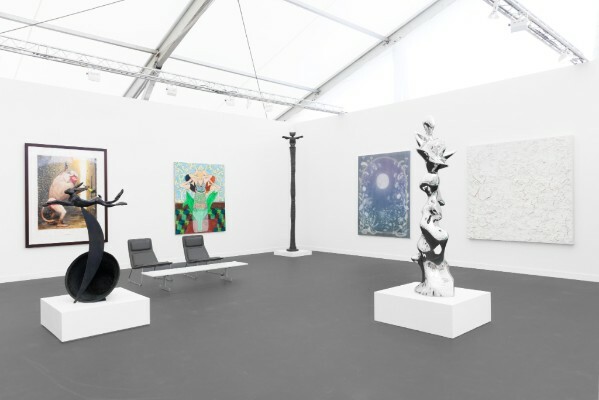 Kasmin Gallery presented a spotlight selection of works including Flanagan’s Musical Hare on Crescent and Bell (1995) at Frieze New York from the 3 – 6 May. 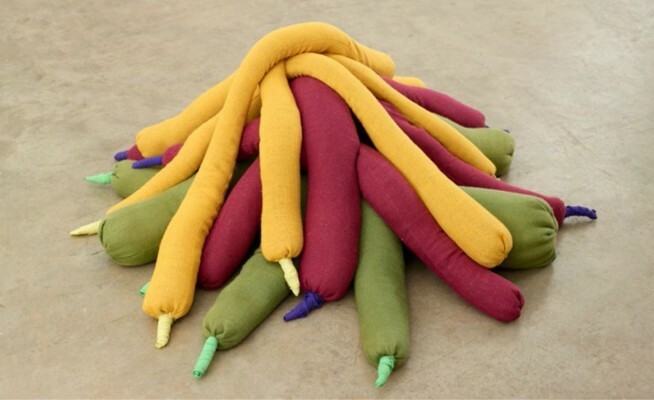 Works included those by Theodora Allen, Saint Clair Cemin, Max Ernst, Walton Ford, Roxy Paine, Elliott Puckette and Bosco Sodi. Flanagan’s Acrobats (2004), installed in TEFAF NY, Historic Room No. 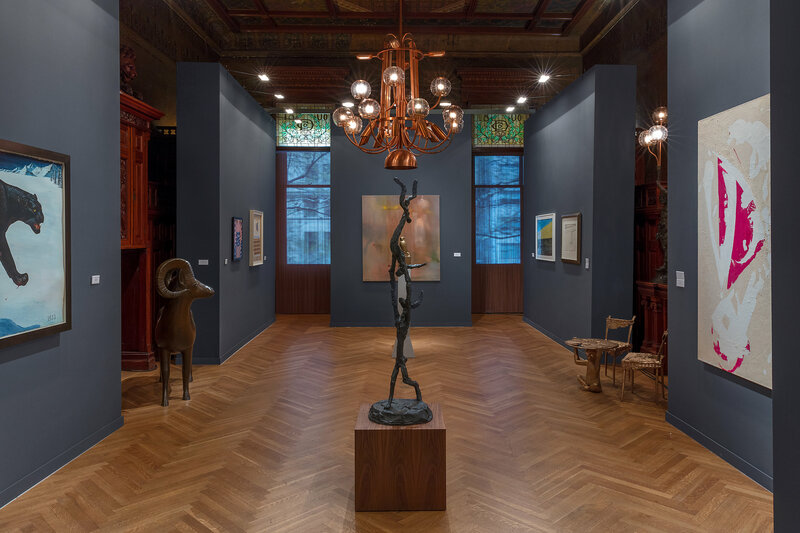 5 at the Park Avenue Armory, by the Kasmin Gallery. This postwar and contemporary presentation of works included Milton Avery, Max Ernst, Lee Krasner, Les Lalanne, Walton Ford and Robert Motherwell and ran from 4 – 8 May. Photos by Diego Flores, courtesy Kasmin Gallery. As detailed in our last newsletter, Flanagan’s Heap 4 ‘67 (1967) is included in Kaleidoscope: Colour and Sequence in 1960s British Art, which finishes up in the Walker Art Gallery, on the 3rdof June. Don’t miss this, the first Arts Council Collection survey of 1960’s art for over 20 years. This exhibition at Custot Gallery Dubai brings together jewellery designed by some of the 20thcenturies most well-known figures. 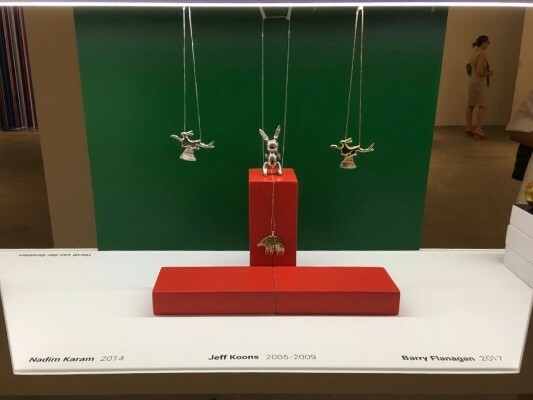 Pictured Flanagan’s Tattoo 51 (2017) pendants are shown alongside jewellery by Nadium Karam and Jeff Koons. 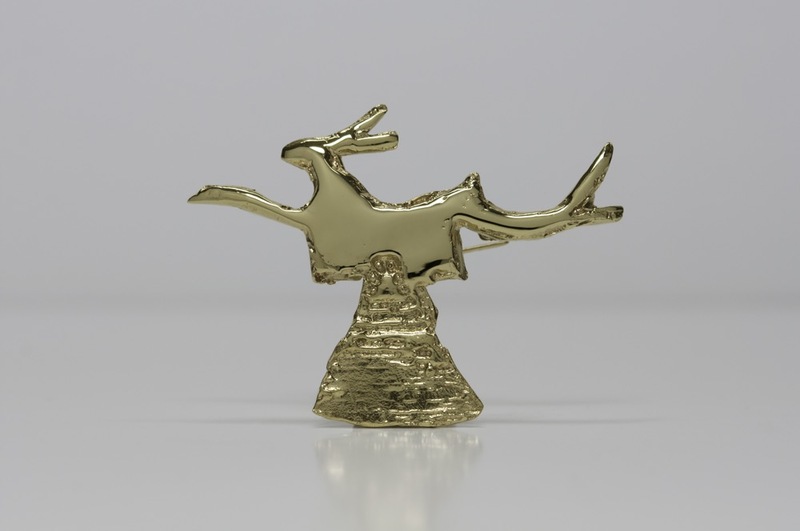 The Tattoos in gold and silver are exhibited alongside the jewellery of Ron Arad, Peter Blake, Alexander Calder, Enrico Castellani, Ian Davenport, Niki de Saint Phalle, Monir Shahroudy Farmanfarmaian, Lucio Fontana, Anthony Gormley, Sahand Hesamiyan, Pouran Jinchi, Anish Kapoor, Nadim Karam, Jeff Koons, Pablo Picasso, Marc Quinn, Pablo Reinoso, Hervé van der Straeten, Sophia Vari and Bernar Venet. Info on their website. 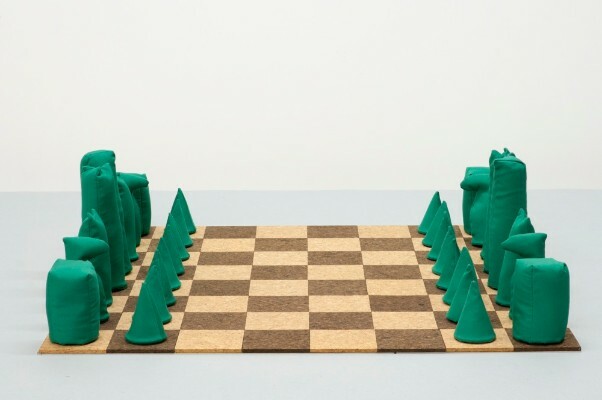 Flanagan’s Chess Set (1973), is currently showing in The Revolutionary Suicide Mechanised, Regiment Band, Part 2 at Rob Tufnell gallery alongside Alexandra Bircken, Derek Boshier & Christopher Logue, Jacqueline De Jong, Poul Gernes, Allison Katz, Jim Lambie, Christopher Maclaine, Oliver Osborne, Dieter Roth, Emily Mae Smith. The exhibition bills as an ‘appropriately discordant assembly of exuberant non-sequitors,’ and runs until the 2nd June info on their website. 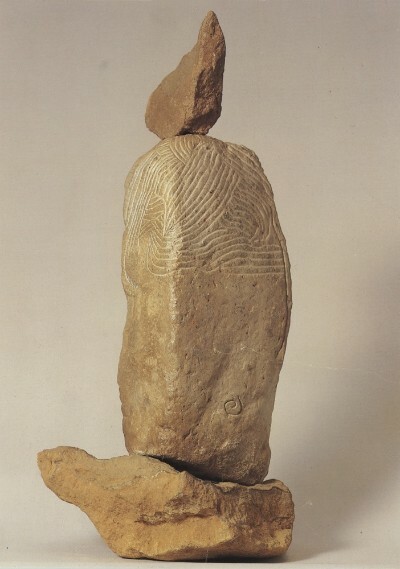 Flanagan’s clay figure ’75 (1975) is included in the new display presented by Henry Moore Institute and the Leeds Art Gallery. The exhibition celebrates their thirty-six year partnership that has built one of the strongest collections of British sculpture in the world. Check their website for the expansive list of artists involved.